Time of the year again when you see excited kids and anxious parents going shopping for their back-to-school supplies. As per a study conducted by National Retail Federation, an average American family spends over $600 on back-to-school supplies. This is a lot of money especially when you have to save for college fund and for the future. 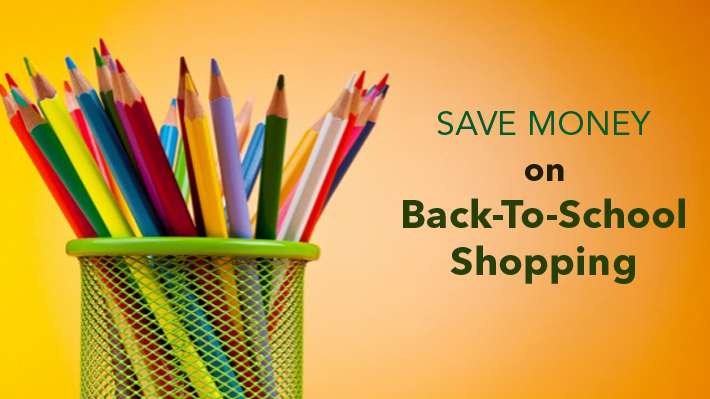 Here are some tried-and-tested tips that will help you save on your back-to-school shopping year on year. The first thing that you need to do is create a list of every single item you want. Oh, I have it in my mind...I do it every year… However silly or hyper-methodical it may seem, but saving money on shopping always starts with a list. List down every item, even the smallest of the things you may need. You’d thank yourself at the end of your shopping. There are so many things that might be just lying around the house. Check backpacks, drawers, wardrobes and all storage places in the house. If anything mentioned in the list is found, cut if off the list. Decide where you want to go shopping and check out coupons. Many stores offer discounts. A good idea would be to download an app from a coupon store. For instance, the GeoQpons app notifies you of the best discounts available across stores. You can get both online and in-store coupons. There are things that you know you would need the year round, like stationary, buy these things in bulk. There usually are discounts on bulk buying and then there is buy-one-get-one offer or other offers that make bulk-buying a whole lot sensible. If there’s something that can wait, hold it until the stock clearance sale after this shopping season. But you will have to choose from the leftover stock, so see if it’s worth the wait. Especially with clothes you might not want to buy all at once because before you know your kid will out-grow the clothes. A $20 backpack might not be that great a deal because in probability it wont last long. Also, go for practical and functional stuff rather than just jumping on to fancy stuff because your kid would like it. This actually could be a great place for you to start teaching your kids the difference between functional and fancy.